Ronald McAdams, 61, tells how buprenorphine, an opioid-based treatment medication, helped him overcome a 35-year opioid addiction. Despite an opioid overdose epidemic that has killed thousands and stalled the lives of many more, Philadelphia still has plenty of treatment slots, both inpatient and outpatient, that are going unused. So on Tuesday, city officials announced an ad campaign to encourage more people to get started on what is considered the gold standard for battling an opioid addiction, medication-assisted treatment. The $200,000 campaign in English and Spanish, which will include TV spots, billboards, and ads on public transportation, encourages people in opioid addiction to get started on buprenorphine, one of the three most commonly prescribed medicines to achieve lasting recovery. Health officials said getting more people into treatment is crucial in a city where 1,217 people died of overdoses in 2017 and an estimated 1,100 died in 2018. While the city once was reputed to have particularly pure heroin, now contamination with the synthetic opioid fentanyl is behind the vast majority of the deaths. 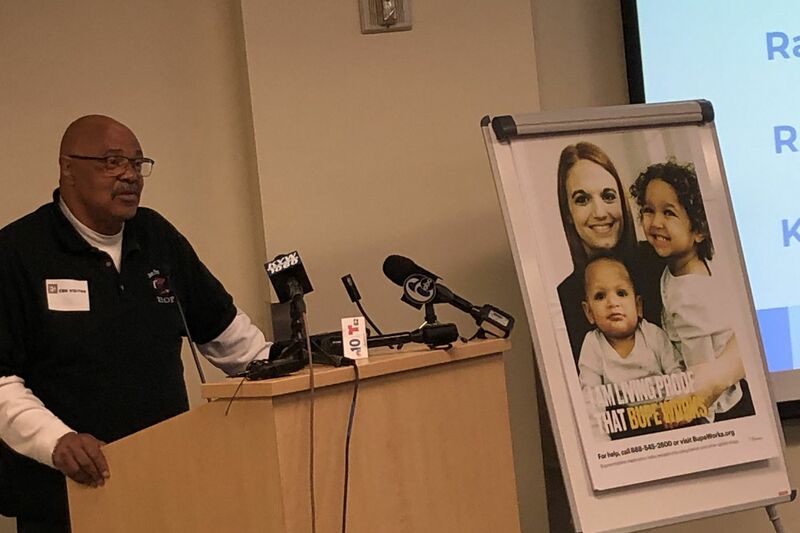 The new campaign features four Philadelphians who used buprenorphine, or “bupe,” as the ads call it, to treat their own addiction. “Without bupe, I wouldn’t be at the point I’m at now. I’ve been struggling with this disease over 35 years or more, and now I am grateful to wake up,” said Ronald McAdams, 61, one of the people featured in the campaign. He started taking buprenorphine a year ago, and has since reconnected with family members and returned to school. Wiping away tears, he told the group gathered for Tuesday’s news conference that he will finally get to hand his mother his high school diploma in June. Kinzie credits the medication with helping him get off the streets and reconnect with his family. Yet he was reluctant to admit using bupe. Medication-assisted treatment has incorrectly been stigmatized as trading one addiction for another, but years of research show that it gives people with addiction a far better shot at recovery than counseling alone. Health officials blame that stigma for the city’s 3,000 empty MAT slots, which combine treatment drugs with therapy. Between the third quarter of 2015 and the third quarter of 2018, the number of Philadelphians getting treatment for opioid use disorder paid for by Medicaid increased sixfold. But about a quarter of the city’s MAT slots are still empty, said David T. Jones, the commissioner of the Department of Behavioral Health and Intellectual disAbility Services. He called the new campaign “an immediate and local call to action." The announcement of the new ad campaign came a day after Jennifer Smith, the secretary for the state Department of Drug and Alcohol, told a state Senate committee that opioid deaths around the state seemed to be plateauing. But, she said, cocaine and methamphetamine use, for which there are no federally approved medication-assisted treatments, are on the rise. Cocaine and methamphetamine deaths have also risen in Philadelphia over the last several years, though not as rapidly as opioid deaths; Jones said the city was focusing on prevention efforts surrounding those and other drugs.